Wow, it's been a while since I've baked with TWD. I don't know what happened, all of a sudden I have no desire to want to bake or eat sweet treats. I guess that could be a good thing, right? But because I admire Dorie, I'll pick it up and keep baking along with her. 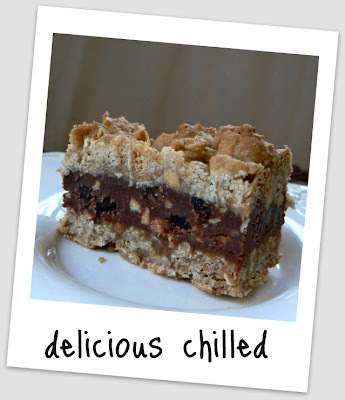 Lillian of Confectiona’s Realm chose Dorie's Chocolate Oatmeal Almost-Candy Bars for her week at TWD. This is basically a layered cookie bar and it makes a 9x13 pan full, so you may want to half this recipe or wrap up and freeze what you can't eat now, to have for another time. That's what I did. I went ahead and cut some when they cooled off, and chilled the rest. Dorie likes her cold so I had to see what they were both like. Cutting them chilled makes it a lot easier, you can slice them pretty thin (mine were 3/4" thick), and I have to admit even though I liked them at room temp. and chilled, I liked them cold best. These little guys are rich though with the chocolate, cookie layer, peanuts and the raisins. A little piece is all you'll need. If you would like to try this recipe click over to Lillian's blog, she'll have the recipe posted for ya. I never chilled mine and now I wish I would have to see how they were different. Yours look great! Mmmmm...I am now lamenting my laptop's lack of a drool cover! Great looking bars. I loved them too and thought they were much better then candy bars!! Gah, those are delicious-looking. One of our favorite local restaurants makes a Snickers cake that looks almost like that... we order it every time we're there. I hope to see you there and enjoy some more yummy ideas. Enjoy. This looks so yummy! I love chilled desserts! I can't wait to try this myself! Thanks for the post!